Everyone has a vice. For some people it’s a glass of wine with dinner, for others it’s a bit of chocolate after lunch. For me? French fries. Anytime of the day. Anywhere in the world. I don’t have a type either. Waffle fries, shoestring, crunchy, soft, salty, parmesan, drizzled with truffle oil…it doesn’t matter. In honor of my vice, I have created a salty blend of spices with a kick to top the perfect crispy, thick cut steak fries! 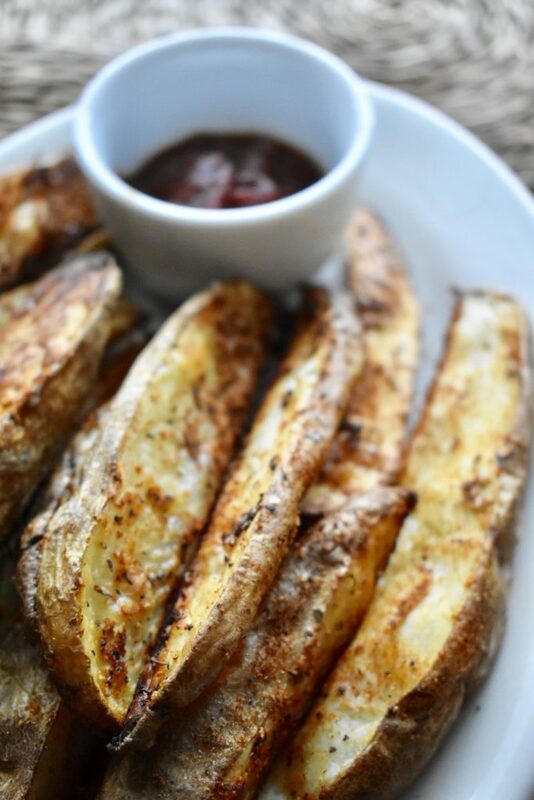 The beauty of this recipe is in a tip I found online (bless you, Pinterest): after slicing the potato wedges, microwave them for 5 minutes, uncovered. This will not only get some of the water out, but also give you that soft inside with that perfect crispy outside. Honestly, these fries are so delicious. So head to your pantry, grab those potatoes that have been sitting there since your last grocery run and slice them up. Don’t forget to serve them with your favorite Mama Jess Organic Garden Ketchup too! Scrub potatoes well and cut into 6-8 wedges. They don’t need to be super thin, but they also shouldn’t be more than a ½ inch thick at the base. Lay wedges on a microwave safe plate in an even layer, you may have to do them in batches. Microwave, uncovered, for 5 minutes. This will help get rid of some water and also ensure the outside of the fries are crispy! Lightly spray a baking sheet with olive oil spray, placing the potato wedges in an even layer over that. To make the seasoning, add all of the spices into a small bowl and combine with a fork. Lightly sprinkle the seasoning over the wedges, making sure to cover each side (I had to rub some on to make sure they were covered thoroughly). Bake for 12 minutes, take out and flip each wedge over to the other side, and bake for another 12 minutes. 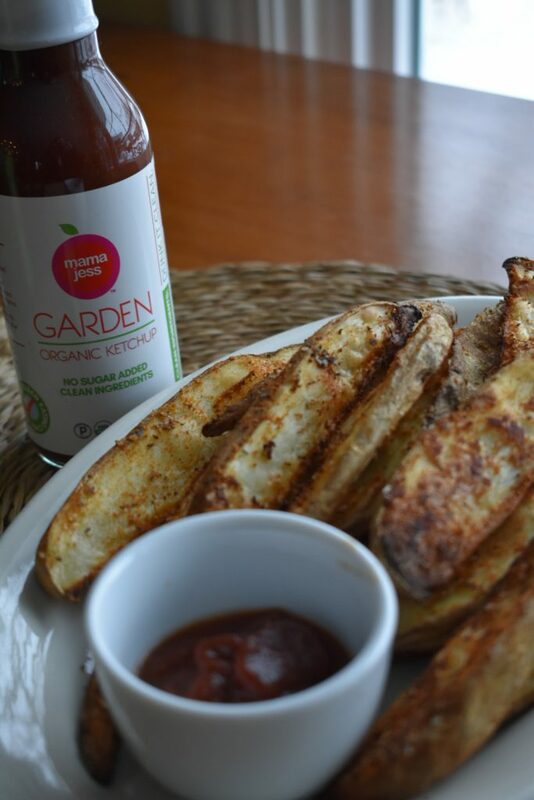 Serve with your favorite Mama Jess Garden Organic Ketchup to dip!